Punjab government is offering a new online driving license verification facility for any driving license issued in Punjab. You do not even have to have your driving license number with you, it actually works based on your CNIC (Id Card) Number. You just need to enter your CNIC Number and it will show complete details about your driving license. This is useful in couple of scenarios. Firstly, if you have lost your driving license, and when you go to traffic police office, the form you have to fill have a data field, where they as you to write in your old driving license number. You can just pull this number from this online system before going to traffic police office or even on your phone, based on your CNIC Number. Secondly, if you are hiring someone as a driver or hiring to run your car with Uber or Careem, or even as conventional taxi, you can use their CNIC Number in this online system to verify either they have valid Driving License. System also tells other details like when the driving license was issued first time to the person, when it was renewed last time and when it is going to expire. So this all info is obviously very useful when you are going to give your car to someone to drive for your or drive as a taxi. 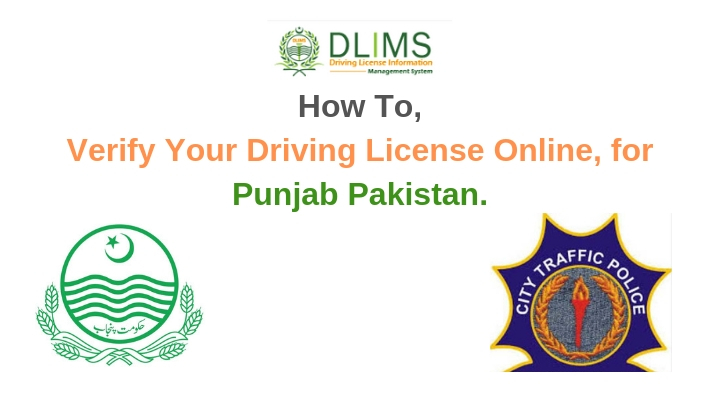 Now, its the time for big reveal, we have created a special short link to the driving license verification system, which is bit.ly/punjabdlv, here ‘dlv’ stands for “Driving License Verification”. By the way, government calls this system DLIMS (Driving License Information Management System) Punjab. Oh and yes, I have shot a video and published it on youtube, about how this process works and how can you find your driving license number in Punjab if you have lost it. Or even how can you see details of someone’s driving license. So, for all this process detail, watch following video. I am sure, you will find all this information useful. Do share your thoughts, experiences or even questions in comments section below. Also, Like use on Facebook and Follow us on twitter using the options on right side of this page. Peace!